Guillermo Leon cigars are crafted with a pretty impressive blend of tobaccos from six different nations. For starters it has a dark Ecuadorian Habano Vuelta Arriba wrapper, two awesome binders (a Cameroon and a Dominican Corojo), with some of the best long-fillers from Peru, Brazil, Nicaragua, and the Dominican Republic. 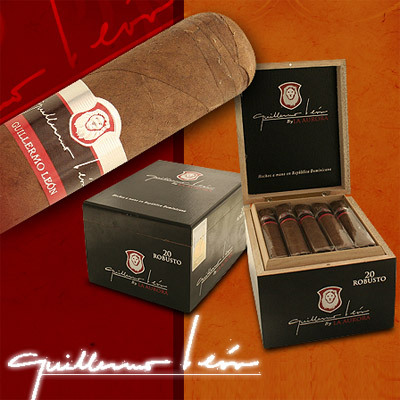 This cigar is named after the Executive Vice President of La Aurora S.A. (which makes La Aurora, Leon Jimenes etc), Guillermo León himself. This cigar can be easily summarized as a medium-bodied cigar, with a peppery, cedry, and coffee-like flavor, but overall is a really smooth smoking cigar that you'll enjoy!